Scottscope: Cool Characters: Mark "Gor" Lee Searches For "A Better Tomorrow"
Cool Characters: Mark "Gor" Lee Searches For "A Better Tomorrow"
Chow Yun Fat is largely known to westerners as the hit-man with a heart of gold in John Woo's The Killer, or perhaps even the love interest in Ang Lee's Crouching Tiger, Hidden Dragon. While both films are more than notable in Chow's filmography, there is one role in particular that probably had an even bigger impact on film history as a whole. In 1986, John Woo changed the face of Hong Kong cinema with melodramatic crime film called A Better Tomorrow. The film set box office records and won awards. Much of its popularity stemmed from the staggeringly staged gun play. Eastern and western audiences had not seen anything like it since the heyday of Sam Peckinpah. However, stylistic flourishes and technical proficiency by themselves rarely create a phenomenon of such magnitude. At the heart of John Woo's ballistic ballet stood a dashing rogue who would soundly crush the notion that Chinese men had no swagger. 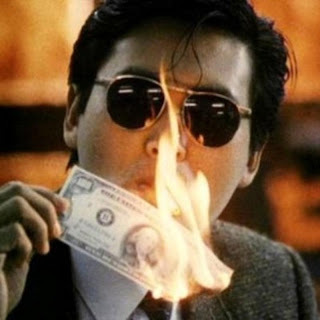 Mark "Gor" Lee (Chow Yun Fat) and his pal Sung Tse-Ho (Ti Lung) are partners in a counterfeiting ring in Hong Kong. Ho's idealistic younger brother Sung Tse-Kit (Leslie Cheung) has ambitions to become a policeman and is about to enter the academy. Their father is knowledgeable of how Ho makes his living and pleads with him not to let Kit find out. In a sense, the two have conspired to keep the Kit in a state of perpetual stunted growth. By blinding him to the truth, he has a perception of Ho that is steeped in fantasy. This preserves the ignorant bliss that is their relationship in the beginning, but the rose colored glasses over Kit's eyes are soon ripped off in a violent rude awakening. Their father is killed by Ho's double dealing business associates. This tragic turn of events reveals Ho's criminal life to Kit, who blames him for what happened. His lack of forgiveness fuels his time in the academy. Ho is simultaneously stabbed in the back by his associates and is sent to jail after surviving a failed ambush during a business deal in Taiwan. Upon his release he is reunited with Ho and his resentful younger sibling. Ho settles for a meager yet legitimate existence as a Taxi driver. The basic story is compelling, and all the principle players turn in strong performances. 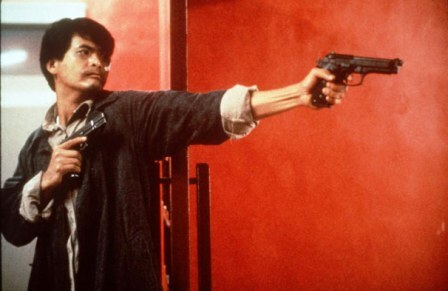 It is Chow Yun Fat's charismatic turn as Mark Gor that solidifies the film's place in cinema history. Mark is, in a sense, the Manalo to Ho's Tony Montana. He enjoys being a gangster and all the perks that go with it, but doesn't celebrate it. It comes as naturally to him as breathing or blinking, so much so that his overall demeanor is smooth yet jovial. He loves the ladies, and is fiercely loyal to his friend and partner. He fully gets into the part, sporting a match stick perpetually lodged in the corner of his mouth. In sunglasses and a trench coat, he is much more dapper and stylish than the cosa nostra ruffians of Scorcese's world. Mark is a GQ gangster. He'd rather slice you with a razor than bludgeon you with a bat, better still, he'd rather shoot you from distance. Why get a nice new suit all sweaty and bloody? Don't be fooled, it would be a fatal error to mistake his immaculate image for prissy reluctance. Despite his dapper appearance, messing with his money and/or his partner brings out the worst in him. When Ho is arrested and imprisoned after being double crossed by Taiwanese associates, Mark Tracks them down at a tea house. After strategically placing semiautomatic pistols in the potted plants that line a hallway, he enters the room where Ho's betrayers dine without a care in the world. A door slides open to reveal Mark glaring down on them like an angry storm cloud itching to unleash a torrential downpour. The tension gets our adrenaline pumping before a single shot is fired. Then, justice is unleashed. Just as the group looks up to see the angel of death that has come to collect his due, Mark whips out twin semi automatics and unleashes an orgiastic volley of gunfire. His enemies twist and contort in mid air as their bodies are perforated by 9mm rounds. Every moment of their agony is captured in glorious slow motion. The only image rendered in real time is Mark blazing away. It can not be understated how powerful a sight this is. The lobby shootout in The Matrix gained much from this trench coat, sunglasses and leather fetish motif and owes a huge debt to the tea house sequence. 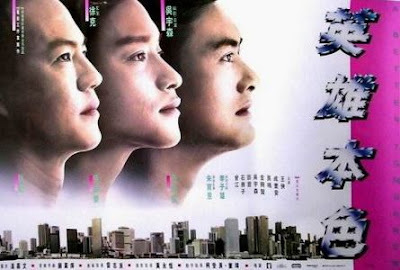 The characters wardrobe proved so popular that Hong Kong youth adopted the style, which became known as "Mark Gor Lau", which translates to "Brother Mark's Coat". Quentin Tarantino even commented that he dressed like the character for a while after seeing the film. Mark makes his way into the lobby, dispensing of all the goons that have been alerted by the sounds of gunfire using the weapons he planted. Just as he seems to be making his exit, one of the wounded crawls out shoots Mark twice in the leg. We hear an excruciating crunch of shattered bone as Mark's leg is rendered useless. He retrieves one of his stashed weapons while falling and returns fire, putting down his crippler. He then limps over to the man in trooper fashion, leaving a trail of blood that cuts through the hallway like a dividing line on a city street. Without a hint of emotion, Mark finishes him. Thus ends one of the most influential and riveting shootouts since the cathartic ending bloodbath from The Wild Bunch. Ho Tse Sung: Do you believe there's a God? Mark Gor: Yes. I am God. You're one. A god can be human. A god is someone who controls his destiny. Sometimes, there's things you can't control. You win some, you lose some. Ho has resigned to the lessons that the universe has taught him. His time in prison, the loss of his father and the resulting estrangement from his younger brother can be seen as a trifecta of plagues that have been visited on his family. His attempt to live the straight life upon release could be seen as him doing his penance for past sins. Mark feels no guilt, in fact he has a sense of entitlement for the happy ending that fate tried to deny him. He wants his better tomorrow and will fight for it. The fact hat he makes his money through illegal means doesn't even register as an afterthought for him. Ethically and morally, his one consistent value seems to be loyalty. 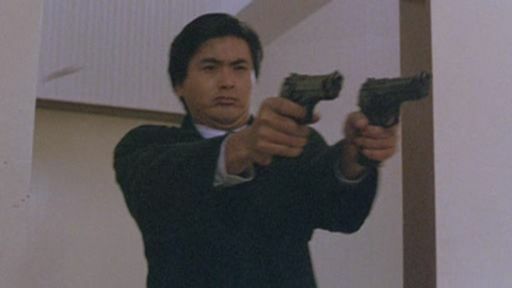 Chow went on to do other films with John Woo that are more widely regarded in the States. Hollywood never found quite the right vehicle to showcase his super coolness, leaving fans at a loss to explain their fascination with him to the lay person. In the early passages of A Better Tomorrow, Mark Gor seems to have swaggered out of some alternate universe that is part classic Warner Brothers gangster film and part Blaxploitation. Everything just seemed to bead up and roll off of him as if he was coated with Teflon. After his power is snatched away like Samson shorn of his locks, he is not without dignity. His old self goes into hibernation, waiting to come to life again. The crippled Mark Gor is a has been who resents his has been status, and makes one more try for the brass ring. There is never a moment we are not on his side, criminal or no. Mark Gor Lee is the coolest gangster character in the gang cinema history. 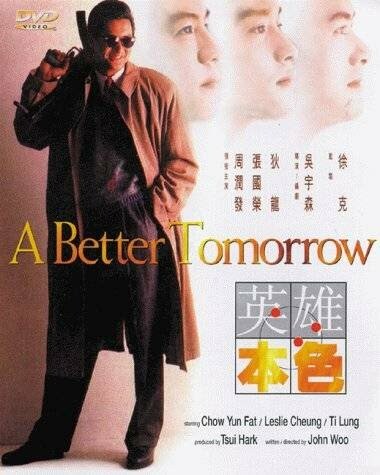 Chow Yun Fat stole the show in this movie and as evidence the next two 'A Better Tomorrow' movies centered around his character and Ho disappeared into a secondary character.